Spring 2018 NOMA-Tulane School of Professional Advancement (SoPA) Design Symposium is themed “Photography and Fashion: Capturing and Creating Costumes and Couture.” Panelists include Susu Kearney, Katie Johnson, DeAndre Beverly, George Long and Glade Bilby. The panel will be moderated by Cassie Worley and Carrie Schwartz, Senior Professor of Practice in the Media Arts & Digital Design Program at Tulane University. Following the panel discussion, exhibitions and demonstrations by students may be seen in the Great Hall. The symposium will be a culmination of Design Week at SoPA campuses. Read more about the presenters here. Arrive early to capture your own fashions on film at the Deep Fried photo booth, beginning at 5:30 pm. SoPA will award a prize for the best dressed, chosen from images taken by Deep Fried. The winner will be notified by email. SoPA invites attendees to donate gently used women’s dresses, shoes, business attire, scarfs, hats, and purses. All items benefit Dress for Success, a nonprofit that empowers women to achieve economic independence by providing a network of support, professional attire, and the development tools to help women thrive in work and in life. Joshua Paxton has been a fixture on the New Orleans music scene for the past ten years, performing as a solo artist, group leader, and sideman with many of the Crescent City’s top names. His diverse musical background ranges from avant-garde jazz to stints with major label rock bands. Though classically trained, by the end of high school he saw his future in jazz. As an undergraduate he attended the University of Miami and Bowling Green University, then went on to study under Ellis Marsalis at the University of New Orleans, earning a master’s degree in Jazz Piano. Join Curator Katie Pfohl and artist Carlos Rolón for a tour of the exhibition Carlos Rolón: Outside/In. Rolón is internationally recognized for his paintings, sculptures and installations that break down walls. Working with shattered glass, wrought iron fences, and construction cinderblocks, his art takes these barriers to access and transforms them into new points of entry. Outside/Inexplores the rich connections between New Orleans, Latin America, and the Caribbean through allusions to each region’s natural and built environments. Admission: $18 general admission, $12 NOMA Members. Advance tickets may be purchased at Eventbrite. Inspired by Luis Valdez’s legendary Teatro Campesino shows on flatbed trucks in the 1970s that brought attention to the plight of migrant workers in California at parks and union halls, José Torres-Tama and the ArteFuturo Ensemble roll out the Taco Truck Theater/Teatro Sin Fronteras with a GMC vehicle repurposed into a mobile stage that crosses economic, geographic, and racial borders. 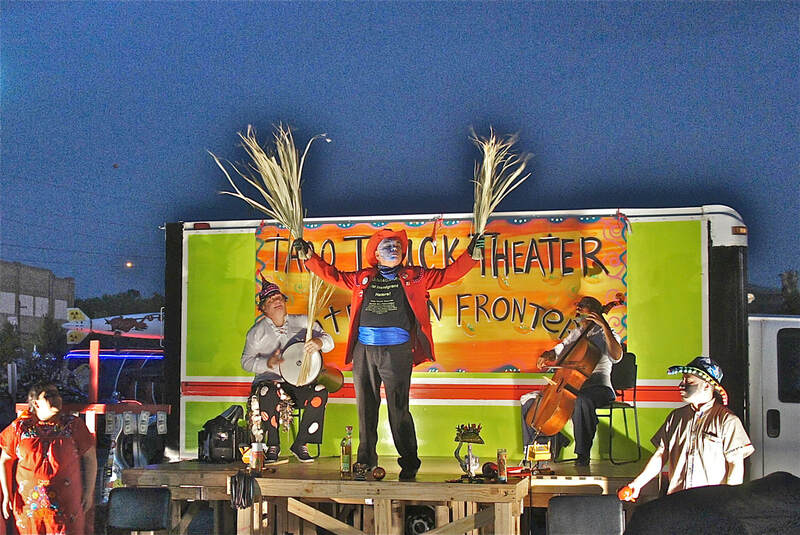 Driven by a live music sound-bed and a street performance vibe with pop-up food vendors, the theater company challenges the anti-immigrant hysteria gripping the country. The diverse and bilingual ArteFuturo Ensemble perform a visually dynamic show with moving stories that offer a parallel between Latino immigrants dehumanized as “illegal aliens”, and the historical struggle of African Americans with a national crisis of police shootings of unarmed black civilians. Friday Nights at NOMA is supported in part by grant funds from the Azby Fund; Ruby K. Worner Charitable Trust; New Orleans Jazz & Heritage Festival and Foundation; and the Louisiana Division of the Arts, Office of Cultural Development, Department of Culture, Recreation and Tourism, in cooperation with the Louisiana State Arts Council as administered by the Arts Council of New Orleans.